Kenneth Reginald Gunnery Hunt was born in Oxford in 1884. His grandfather was a missionary working among the Native American tribes in the United States and his father, Robert, although he spent a number of years training for a position in the stock exchange was eventually ordained as a priest in 1876. At the time of his son’s birth Robert Hunt was working at establishing an Oxford base for the Bible Society whilst also studying to complete his masters degree. From Oxford the family moved to Islington where Robert spent four years as the vicar of St Andrews Church and then moved again, this time to St Marks Church in Chapel Ash, Wolverhampton. Whilst many less-well-off youngster at around this time would leave school at 14, Hunt stayed on, attending Wolverhampton Grammar School and it is here that he first started to play football on a regular basis. By 1900 he was captain of the school team with one report stating that he ‘kicks and tackles well’. From the Grammar School Hunt went on to Trent College in Derbyshire to complete his studies prior to university. At Trent he was captain of both the Football and Cricket teams whilst also taking part in other sports. The next stop in Hunt’s academic life was a return to Oxford where he started attending Queens College in 1904, working towards an honours degree in ‘Moderations’ and planning to follow his father into the clergy. It was at Oxford that his football skills started to really blossom. For four years he represented Oxford in the varsity match and was awarded his ‘blue’ four years running. He also turned out for the famous Corinthian team made up primarily of Oxford and Cambridge students. Whilst his studies and playing football took up most of Hunt’s time it didn’t stop him from pursuing other activities including joining in with some classmates in pushing a handcart from John O’Groats to Lands End. 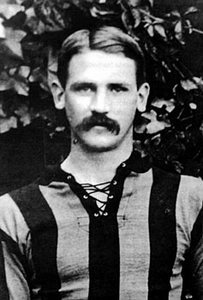 By the 1907-08 season Hunt was signed by his local team Wolverhampton Wanderers where he quickly became a regular in the first-team. In that season’s F.A. Cup Wolves drew 1-1 with Bradford City in the 1st Round. It was to be the only goal conceded on their way to the final (including a win over Swindon during which the left-half was knocked unconscious twice). 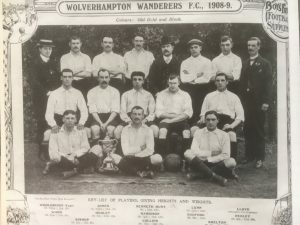 Cup fever gripped Wolverhampton in the lead-up to the final with the local Express & Star going to the expense of installing a telephone line. Their correspondent at the match would ring through at regular intervals with the latest score which would then be conveyed to the waiting crowd outside the newspaper’s offices via a large blackboard. In the final at Crystal Palace Wolves came up against Newcastle United. The Geordies were clear favourites. They had won the title the previous year and would go on to finish 4th in the title race in ‘07-‘08 while Hunt’s team were headed for a mid-table position in the second tier. United were on top in the early stages but Wolves (described at the time as a ‘rough and tumble team’) held firm and approaching half time a ball was cleared from the Newcastle area and fell to Hunt who lashed it home for his first-ever goal for the club. That trophy, notable as it was, would perhaps only rank second in Hunt’s list of sporting achievements in 1908. 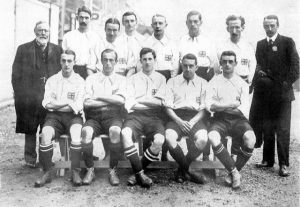 The Oxford/Wolves man was chosen for Great Britain, one of eight teams to enter the football tournament at the 1908 Summer Olympics in London. Two of the others, Hungary and Bohemia, would withdraw before the start whilst the French entered two teams. In truth the tournament was something of a mismatch until reaching the gold medal match. Great Britain beat Sweden 12-1 and the Netherlands 4-0 to reach the final whilst Denmark scored 26 goals in two games. Meanwhile France were so shocked by the 9-0 drubbing handed to them by the Danes in the semi-final that they withdrew from the Bronze medal match. Great Britain. Olympic champions 1908. Hunt back row, far left. The final was more competitive. England ran out 2-0 winners thanks to goals from Fred Chapman and Vivian Woodward and Hunt added Olympic gold to his cup winners medal. Hunt would spend just one more full season at Wolves before his circumstances changed necessitating a move. 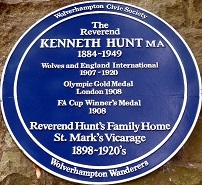 In 1909 Hunt was ordained as a Deacon by the Church of England and became a housemaster at Highgate School (he was later made head of a new ‘house’, Grindel whose colours he decided, would be old gold and black matching those of his beloved Wolves). Two years later he took his final vows and became a full qualified priest. During this time he played for Leyton whilst occasionally venturing back up to the midlands to turn out at Molineux. The new job certainly didn’t hinder his footballing progress. In 1911 he was picked for England making his debut in the 3-0 win over Wales at The Den and appearing again in the 1-1 draw with Scotland at Goodison Park. In 1912 Hunt switched allegiance to Crystal Palace and he would also play for the English Wanderers and New Crusaders before guesting for Palace during the war and then returning to play for Oxford City and Wolves again. His status as an amateur gave him the option to play for various non-league clubs although the ‘transfer’ from Wolves to Palace was deemed ‘illegal’ and the Molineux club were fined £5. Hunt carried on working at Highgate School until retiring in 1945, rising to the post of ‘Second Master’. He represented Great Britain in the Olympics again when, at 34, he was a member of the team that took part in the Antwerp Games of 1920. Whilst at Highgate he taught future Formula One commentator Murray Walker who later recalled Hunt giving him ‘six of the best’ on one occasion. “It started out as three”, Walker said. Hunt and his wife May moved to the East Sussex town of Heathfield on retiring from Highgate in 1945 but he hardly slowed down. He wrote an instructional book about football and became the Amateur Football Association’s representative on the F.A Council in 1946. He was also the founding president in 1948 of Pegasus F.C. the amateur club made up primarily of former Oxford and Cambridge pupils who won the Amateur Cup in 1951 and 1953. Sadly Hunt would not live to see those triumphs as he passed away in 1949, aged 65, after suffering from pneumonia. He died the day before his beloved Wolves won the F.A Cup again and was due to attend the fixture in his position as an F.A Council member before falling ill. He died a wealthy man, leaving money to Trent College among others in his will. Kenneth Hunt was undoubtedly born into a privileged life. The Grammar School / College / University education gave him every chance to succeed in all walks of life. And succeed he did, embracing everything, and in particular Football, with a vigour that enabled him to achieve the most from his sporting life. And he achieved this whilst not letting it get in the way of his other ‘more serious’ pursuits. In that respect he was a true Corinthian, and a cup and gold medal-winning one too.